Besides being funny, I think the chief point is that in today’s always on media world where there’s a constant scramble for the the next story, publishers (whether news organizations or bloggers) fail to verify the provenance of a story. Likewise, it’s difficult for consumers of the story to easily check the veracity of the story. Others have suggested that news organizations put up all their source material. The New York Times has begun to do this in some cases. Unfortunately, most news consumers don’t have the time to actually look at the sources themselves. Maybe the solution is an automated or algorithmic mechanism for verifying the provenance of a story. hmm…. Yesterday, I wrote about the inaccuracy of labels and the confusion they may cause about a product’s provenance. Well what if the entire product is trying to hide its provenance? Check out this post from Next Nature…. amazing… fake plastic bags made from real leather. I first heard about Banksy back when I was living in Southampton. He is a graffiti artist and often paints interesting and fun social commentary anonymously on the side of buildings. A couple of times he’s managed to hang paintings of his unnoticed in major museums including the Tate. 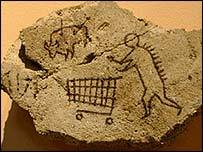 In particular, he managed to get a “cave painting” of a guy with a shopping cart (shown above) hung in the Bristish museum in 2005 as covered by Next Nature. This finely preserved example of primitive art dates from the Post-Catatonic era. Most art of this type has unfortunately not survived. The majority is destroyed by zealous municipal officials who fail to recognise the artistic merit and historical value of daubing on walls. I believe this highlights the difficulty in relying purely on labeling to inform consumers about provenance. For example, while Fair Trade has a wonderful mission, it’s not clear that consumers can’t be fooled by similar labels. Furthermore, the label does not actually convey the real provenance of the product in question. So the question I have is: how can one devise labels or information material that clearly relates the provenance of a product that can be easily understood and authenticated by the consumer?